It’s felt like a long and difficult month, with extra-big failures, sickness, snow, work stress, relationship anxieties, and more. It’s been easy to keep repeating this litany of misfortunes to myself, affirming my misery. Perhaps not surprisingly, I’m having a hard time sleeping and body image issues keep coming up, always signs I’m feeling anxious and out of control. What combats this downward spiral? Filling my mind with “things true, noble, reputable, authentic, compelling, gracious–the best, not the worst; the beautiful, not the ugly; things to praise, not things to curse.” Actively focusing on and being thankful for those things. Not dwelling on the bad, but finding the good. My job. I get to have a job! And it’s one I love, that suits me to a T, and that I excel at. It takes the help of a lot of people–Ian, our parents, our friend who watches B during the week–and I’m also thankful for all those people who make my going to work possible. And, despite tight and constant deadlines, this is the first time I’ve really felt the pressure as anxiety over achieving my deadlines…and the only time I’ve made a serious mistake. I hope to keep that to a minimum! Our family’s health. Sure, we get viruses, but we don’t have any ongoing health problems. Our immune systems work. We all can expect to get up and have a normal day most days without interference from physical infirmity. That’s a huge thing to be thankful for that I know I take for granted all too often. The weather. I’m going out on a limb here, but I think the Seattle area is one of the most beautiful places to live, bar none. I mean, granted, I haven’t been everywhere else, but I know what we’ve got here. We’ve got mountains and oceans, some of the only temperate rain forest in the world, and it’s green year-round on this side of the mountains. And our “unseasonably cold” weather the last 10 days is warmer than the high temperature in many parts of the country. Friends and family. I’m so thankful I get to spend most Saturdays with Dad doing fun and challenging rides that he spends a lot of time organizing each week. It’s so great having someone I know will help push me, but who won’t abandon me when I’m slower. We look out for each other. And then there’s our other ride buddies, guys who show up consistently to Dad’s rides, some of whom we’ve known for years, and who have become my good friends. I’m thankful for those relationships, especially when it brought me Mike Cohen, who’s been my commute buddy from Seattle to back home since I started at my job downtown. I’m thankful for those relationships and that time spent, even as they’re changing. There. In every circumstance I’ve been telling myself things are terrible, there’s something to be thankful for. The last few weeks have been tough. 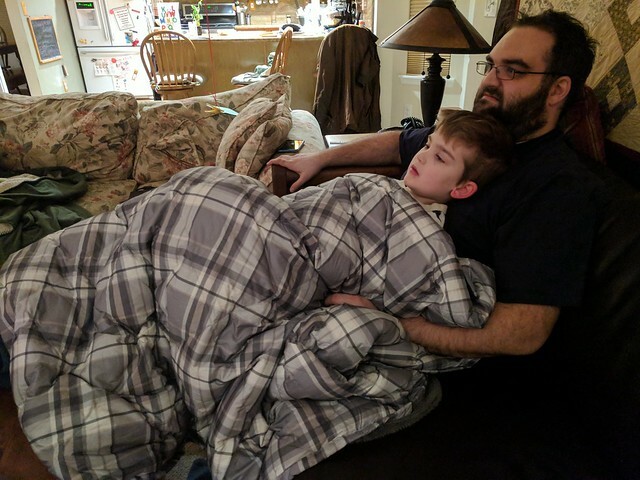 It really started around the my epic PII fail, followed by Benji’s having a fever for six days and the attendant canceling of his much-anticipated California trip. This necessitated my taking some extra time off work, and the timing proved unfortunate: I had a release this Thursday, the 22nd, and quite a lot of documentation to write for that. The result was that I worked from home on Monday, which was a holiday (although I also got in a delightfully sunny bike ride, too), and followed that start off with three days of super long workdays. 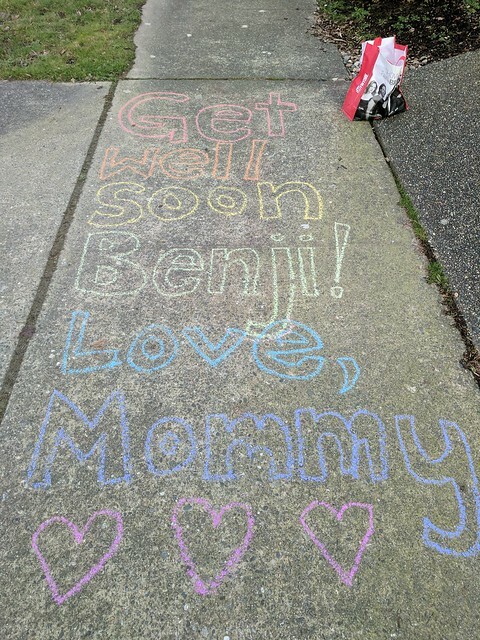 Meanwhile, I’m very thankful that Benji got much better, because this week was also midwinter break. 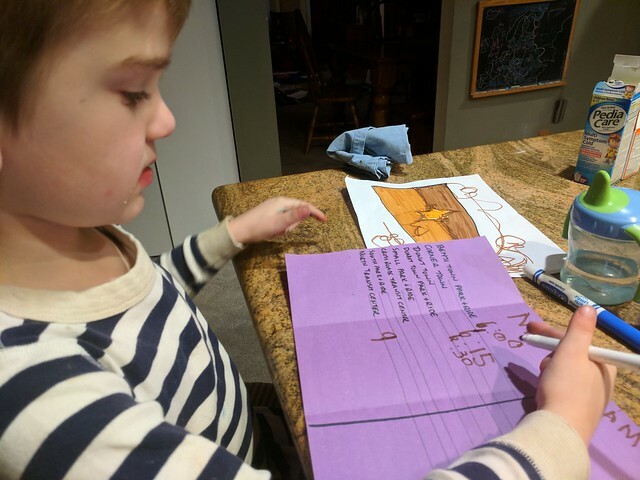 Since he got better, both grandmas split the week up, for which we were most grateful. On Wednesday, my Uncle Gerard flew up from San Francisco and he’s spent the last few days hanging out with Mom and Benji while I worked. Boy did I work: Wednesday I got in at 6:20 and left a little before 6:00, a much longer day than usual. Thursday… we’ll get to it. Uncle Gerard commented that he hadn’t seen snow falling from the sky for at least seven or eight years, but he got to see it twice in the four days he was here. Wednesday night it snowed a tiny bit and then froze. It was just enough precipitation to ice everything over. That’s where our fortunately/unfortunately starts. Unfortunately, it snowed Wednesday night and overnight the temperatures got into the low 20s, guaranteeing that everything froze solid. Fortunately, snow is pretty, and there wasn’t that much of it. Unfortunately, I can’t ride to the bus when ice coats the entire road. Fortunately, Ian and Benji were able to drop me off at the bus on Thursday morning. Unfortunately, I forgot my bike lights and my work badge. Fortunately, I remembered my wallet and ORCA card and my lunch. Unfortunately, forgetting my badge meant I also couldn’t get into the usual secure bike parking; and to access my office, you have to swipe a card on the elevator, so I couldn’t go directly to my office. 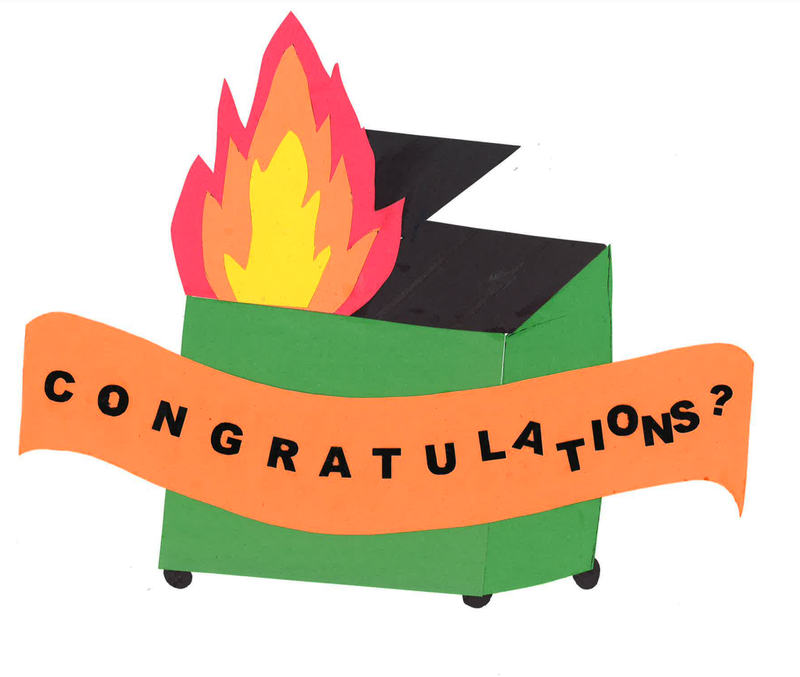 Fortunately, I was able to get in touch with a coworker who was already in the office, and he agreed to meet me in the lobby and do the elevator card-swiping for me. Unfortunately, when I got to my office, a security guard stopped me in the lobby and said I couldn’t take my bike in the main elevators because it was for business people not bikes. Fortunately, he said I could take the freight elevator. Unfortunately, I didn’t know where that was, and when he described it, it was clearly going to take a lot of extra time. Also unfortunately, when I got down there, I was feeling so overwhelmed after everything that when the security guard in the loading dock asked “Do you do this regularly?” I yelled at him, “NO *&^!! @#^&&^%%##@, I DON’T!” –and then proceeded to explain, not at all calmly, about forgetting my badge. Fortunately, the security guard was really kind and calm, and told me where to go from there and wrote me a pass to ride the elevator. Unfortunately, between me and the elevator was a door that was held closed with all the suction of the entire Columbia Center–I couldn’t open it while holding my bike. Fortunately, another guy came along and opened the door for me. Also fortunately, the freight elevator was waiting and there was a guy inside (!) whose whole job it was to punch in what floor you’re going to and then write down what company you work for on a pad of paper. Unfortunately I had an infinite amount of work to get through before the afternoon and I was still feeling extremely unsettled and had a hard time getting down to work. Fortunately, I eventually got through all the stuff I had to finish, although it took all day. Unfortunately, that meant that we started our deploy later in the day than we wanted, and building took a long time because of all the changes. The result was that we weren’t able to start actually checking live pages until very late in the afternoon. Also unfortunately, I had a little over 70 pages to check. This isn’t just a quick skim for many of them to look for minor things like updating a screenshot. This time I deployed a lot of entirely new pages, which involves comprehensively checking every link to make sure each one really goes to the right place. And, most unfortunately, due to some things I don’t want to get into right now, I have to do everything twice. Literally. We are maintaining two different Help Centers right now, and that means every bit of work I do in one has to be done in the other, and then I have to check extra-carefully to make sure they both match. That means my 70 pages to check was actually 140 pages. Fortunately, the manager of the e-Learning group was hanging around to check some video stuff, and while he waited, he helped check some of my links. It was super helpful and he caught a number of places I’d made minor formatting mistakes, so hooray! Also fortunately, my work buys dinner for everyone who has to hang around late for the release. I got tofu pad Thai, which was delicious. I love Thai food. Unfortunately, by the time I finished, it was 6:40 pm and the last 311 bus comes at 6:45. Fortunately, my bike was parked next to my cube, so I grabbed it and zipped downstairs (in the regular elevator) and out the lobby to the street ASAP. Unfortunately, when I got to the bus stop, there was no bus. Fortunately, I checked the bus app and found the bus was scheduled to arrive right then. I looked up and there was a 311! I jumped on it in a flurry. Unfortunately, the bus turned down a different way from the 311, and I realized it was a 312X. I hadn’t noticed the last wrong digit. Fortunately, the 312X goes to Bothell, and I had my bike, so I figured I’d just ride the couple miles back home. It was pretty cold, but the streets in Seattle were clear and dry, so I figured the ice and snow would be gone. Unfortunately, this particular 312X ends in Kenmore, not Bothell, several miles farther from home than I was expecting. Fortunately, I had my bike and I knew how to get home. And fortunately I had my helmet equipped with a headlight and small taillight, so I could see and (somewhat) be seen. Unfortunately, the way home involved the bike path, which was shady and cold all day, meaning it had long patches of ice and snow that I had to slowly and cautiously creep across. It took me 22 minutes to ride just under 5 miles, including having to get off and slip my way on foot across some unavoidable and wide patches of ice. Fortunately, I got home safely (albeit miserably), just a little before 8:00 pm and immediately went to bed. Benji was spending the night at Mom and Dad’s house, for which I was deeply thankful. And, most of all, fortunately I’d already cleared working from home with my boss. So I got to work from home on Friday, and I still put in 10 hours of work, mostly fixing minor defects and then checking them. I’m looking forward to a new week. Watch at least three hours of videos or movies a day. 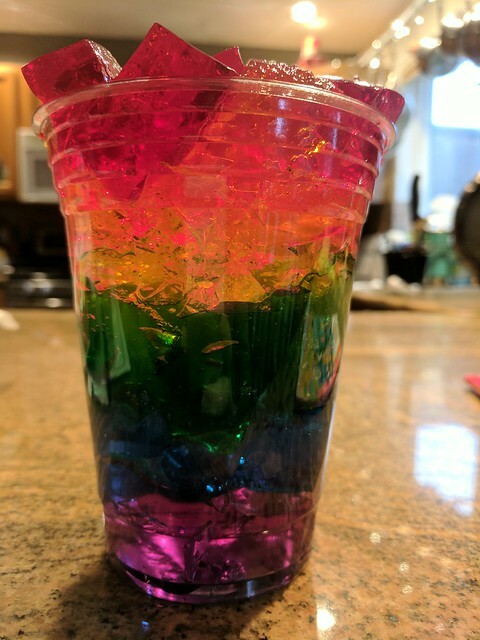 Eat rainbow Jell-O, popsicles, “Awesome sauce,” and donuts. Fight taking ibuprofen, then perk up when it works. 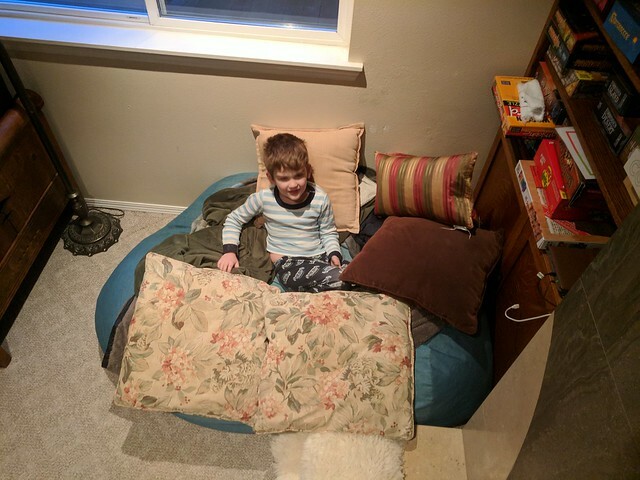 Build a bird’s nest out of a beanbag chair, pillows, and blankets. Color with chalk because it’s not raining. 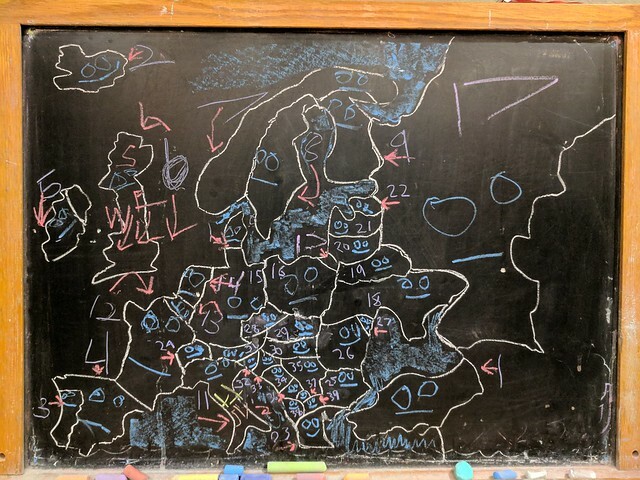 Command Daddy to freehand a map of Europe for you on the blackboard. Create your own bus schedules. 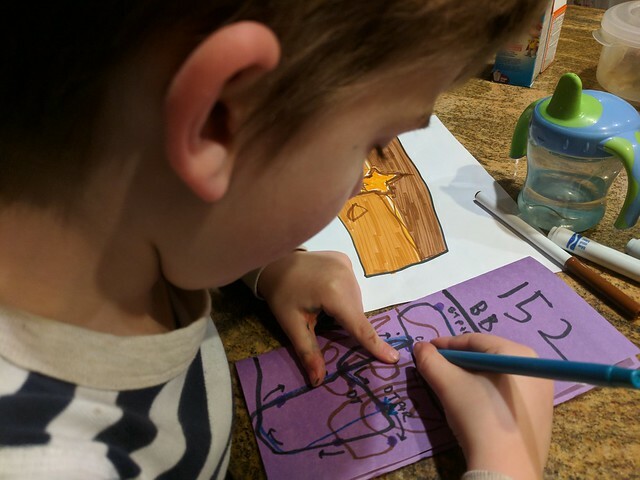 When you’re Mommy, while Daddy draws Europe and Benji creates a bus schedule, you draw flags (another interest that has coincided with his increasing interest in geography). This includes my favorite, the Rainbow Unicorn flag. 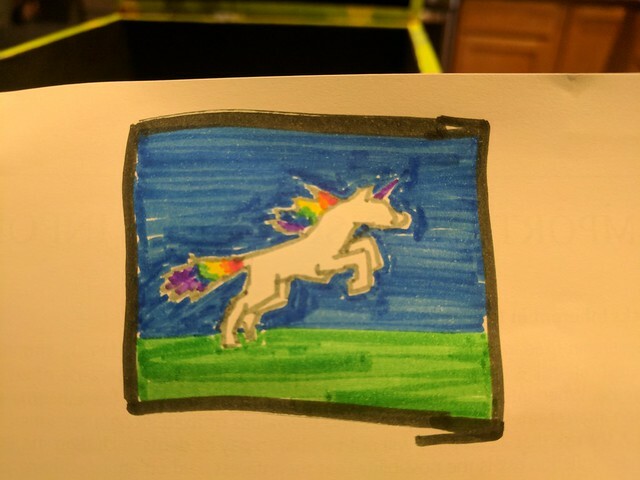 Cuz what country wouldn’t want a rainbow unicorn on their flag? Only monsters. Lastly, when you’re the parents of a five and a half-year-old who just had a high fever for the last six days, you wash your hands until they’re dry and raw, and you pray devoutly that your immune system can stave off whatever the kid had. Because no way do you want to spend the next week in bed binge-watching Netflix when there’s work to be done. “Be careful”: always good advice. But it’s also rather ironic advice, when it comes from a driver who previously just turned aggressively into the flow of traffic. Here’s what went down, and why I was left shaking my head at the audacity of that motorist chastising me. I was riding through downtown Kirkland, like I do most nights (hooray, 520 bridge! You’ve changed my commute forever!). Like most nights, traffic backed up through Kirkland, so as I rode in the bike lane I passed lots of vehicles on the right. It’s the way the bike lane works. I don’t love passing on the right, and when I do I’m always on high alert, looking for vehicles pulling to the right for whatever reason. Kirkland’s setup is one I particularly don’t love: Sidewalk, then parallel parking lane, then bike lane, then traffic lane. This means cars constantly cross the bike lane to park, but drivers aren’t looking for us, so we have to be extra-cautious. Also, it’s a wonderful recipe for getting doored by drivers who swing their doors wide open without checking for a bike going by. Nevertheless, the world is imperfect, and many streets have that layout. So I was cruising along, carefully passing vehicles on the right, when I got to downtown Kirkland. The bike lane ends when you get into the little section of road lined with shops and businesses, but there’s enough of a gap between the parallel parking strip and the driving lane that I can get by — again, with heightened caution. I continued passing vehicles, but more slowly because there are also more intersections, and intersections are the really dangerous part of any ride. And, unsurprisingly, a car turned right just ahead of me. It was coming from a road on the right-hand side and turned onto my road, cutting into the flow of traffic rather aggressively. There wasn’t exactly a gap in traffic where he turned, but in the grand tradition of Masshole drivers (I don’t know if he’s from Massachusetts, but it’s a move I first noticed there), he made a gap. Washington drivers being what they are, the next guy in line just made room for him and let it go. I was approaching that intersection and I slowed down, but wasn’t really impacted. I did, however, make a mental note to watch that driver. One aggressive move could mean other unpredictable moves. Maybe a block later, as I was riding along past that very vehicle, the road hits a T and the lanes split into a left-turn lane and a right-turn lane. Very few people turn right; the vast majority–call it 99%–turn left, at least during that time of day. Of course, there’s always the maverick who’s gotta do something different, and this driver was no exception. Just as I was riding past him on his right, he started moving right to get into the turn lane. I was directly next to him, with nowhere to go. Surprise! Except I wasn’t really surprised, because he just seemed like that kind of guy. I braked, he saw me and braked, and I rode past out of the way. But as he went by me, he rolled down his window and said, “Be careful,” –not in a mean or angry way, for which I was grateful, but in a chastising way, for which I was not. I immediately shot back, “You too,” and he drove off. I hope he heard me, because I really feel that was about the best comeback I could’ve offered, barring a whole discussion on bikes in traffic. “Be careful.” It’s good advice. I ride through hairy messes in downtown Seattle every day, weaving through traffic to take advantage of the fact I’m small and able to squeeze through gaps. But there’s risk, too, and the fact is that it’s easy to become complacent about safety when I ride the same roads every day. The infrastructure isn’t optimized for cycling safety, so it’s up to me to make myself very visible and remain highly alert to any possible hazards. And hopefully the day won’t come when one of those *&^!#%^&*$#@! Uber drivers on Dexter clobbers me. I have a special place in my heart for Uber drivers. It’s a place a lot like a Sarlac pit, where they’ll be digested for 1,000 years. Anyway. Time to hit the road! Having a kid in kindergarten is reminding me of this simple way of looking at the world: there are good guys, there are bad guys, and there’s no in between. No mixed motivations, no ambiguous actions, no questionable qualities. Good guys do good things, bad guys do bad things, and that’s that. Setup: There are two teams in the running and tagging game. Players are divided into either good guys or bad guys at the start of the game. Each team is trying to convert all the other players to their team type by tagging each other. Goal: Good guys want to turn all the bad guys into good guys, and vice versa. Game play: Players convert an opposing team member by tagging. For example, when a good guy tags a bad guy, the bad guy becomes good. The new good guy then has the new goal of converting former teammates, other bad guys, into good guys. This works both ways. If players tag one another simultaneously, they swap roles. No tagging above the neck or anywhere on the head or face. Two players of the same role, touching each other, are protected against one player of the other role. For example, if two bad guys are holding hands and one good guy touches them, they remain bad. In that case, nothing happens to the good guy unless one of the bad guys tags him. Good guys tag with right hands, keeping their left hands behind their bags. Similarly, bad guys tag with their left hands, keeping right hands behind their backs. This makes it easier to know who’s who. The team that ends up converting all the other players first wins. So the interesting thing about this game, to me, is the ambiguity. When we played we never really knew who won, because eventually everyone is converted to the same role, but by then you’re all on the same team, so it’s like you’ve all won. At the same time, you’ve probably swapped roles so many times, you loyalties aren’t even to any particular role–just to tagging people of the other role. I feel like this game is creepily like real life in so many ways. The shifting loyalties; the looking out for your own interests and then the team’s, when they coincide; the never being sure someone’s still on your team; the bring able to team up again weaker individuals — it’s a pretty cynical way of seeing the world, true, but not necessarily untrue.